TDmonthly Magazine is excited to announce our TDmonthly Top Toy Award winners for June 2011. 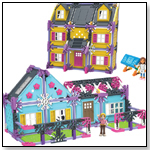 TDmonthly has selected these high-quality, innovative products with high play value to feature to our 94,000+ unique monthly online visitors, helping retailers and consumers make the best possible choices when deciding which toys to buy. Bella Rose Kimochi from PLUSHY FEELY CORP.
3-D Coloring Books from TRI-SMART LLC. No nominees or winners paid a submission fee to be considered or chosen, and we strictly limited the number of award winners, evaluating products based on the above criteria, as well as favorable review from retailers, consumers, experts or TDmonthly staff. How can your toy get a chance to win a TDmonthly award? Safety. 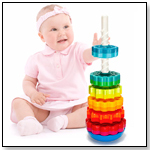 The product meets existing toy safety standards and has been tested and certified accordingly. Age-appropriateness. The product is tested, marketed and labeled for the appropriate age range. Developmental and/or Educational Value. The product contributes to a child’s emotional, physical, social and/or academic development. Quality and Durability. The product is well made of quality materials and has a long lifespan. Innovation. The product exhibits unique qualities and/or new manufacturing processes, concepts or materials that set it apart from existing options. Specialty Focus. The product is at least 80% devoted to the specialty market. This means that 80% of the product’s distribution is through independent channels (i.e. not mass-market stores). Best-seller Status. Based on TDmonthly’s surveys of independent toy retailers, the product or line has shown itself to be a solid seller in the specialty market. Presentation. The product is nicely packaged with appropriate on-pack claims and/or interior instructions, and features a safe, attractive design. Eco-friendliness. Whether through the product’s construction, packaging, utility or educational motive, it exhibits environmentally friendly initiatives in support of a greener earth. Social Awareness. The product carries with it a charitable aspect and/or helps children better understand the world in which they live. If your product is not already on our site (search for it here), please enter it into our system via our online product submission survey. When you complete the online submission form for each product, it will ask that you send an image of the product via email. Images must be 300 dpi JPEG; at least 500 x 500 pixels in size and JPEG ONLY. Images MUST be received for all submitted products in order to be considered for an award. Squishable Fox by SQUISHABLE.COM INC. 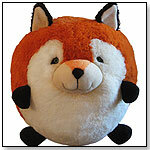 This fox is 15 inches tall and is soft and squishy. Squishables comply with U.S. ASTM F963 safety standards. They're made out of all new materials (100% polyester fiber). Squishables can be spot-cleaned. Also available in a miniature size. — Why it won: These extra soft and plush animal/pillows include a variety of characters we don't usually see in children's toys, such as narwhals. 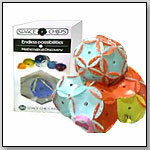 They come in several sizes, too, which make them fun for decorating a kid's or tween's room. With a range of characters from the Google Android to a T Rex, they'll appeal to boys, too. — "Squishables are selling really well. It's a big ball pillow in the shape of animals. We sold 20 last month," Joe Berardoni, owner of Pun's Toys in Bryn Mawr, Pa., told TDmonthly in late Spring 2011. — In a May 2012 survey, Elmer Carranza, manager of Doodlehopper 4 Kids in Springfield, Va., told TDmonthly that they sell six Squishables each month, making them the best seller in the plush category. — Why it won: The pieces are small, flat and flexible, so they won't break if Mom or Dad accidentally steps on them. Kids can play with the toys they make with the Space Chips— balls are both throwable and kickable. And though they were designed to create traditional building structures, kids have used their imaginations and turned the flat clips into suits of armor and costumes. Bella Rose Kimochi by PLUSHY FEELY CORP.
Kimochis are small pillows with a feeling (happy, sad, silly, brave) printed on one side and a corresponding facial expression on the other. Each Kimochis plush character comes with a set of three feelings and a how-to Kimochis Feel Guide. The characters — Clover, Cat, Huggtopus, Cloud, Bella Rose, Bug and Lovey Dove — have a special pocket where kids can store their "Kimochis" or feelings. Using the characters and their Kimochis, kids can get in touch with their emotions through puppetry and play. “Getting back to the basics by playing and communicating with Kimochis™ is a simple, yet powerful way to teach children how to: be aware of feelings, choose how to communicate in emotional moments, and redo mistakes. Children will be drawn to the fun, adorable, accessible characters. Parents will be drawn to the high-quality craftsmanship and the valuable educational content," Susan Schroeder, director of marketing and communications for Plushy Feely Corp., told TDmonthly. — Why it won: The latest line of Kimochis are cuter than ever and just as good at helping children articulate some of their more troubling emotions. Bella Rose is pretty and soft and works just as well as a traditional stuffed animal as she does as a teaching tool. iColor3D Coloring Books by TRI-SMART LLC. Other products from TRI-SMART LLC. With a little help from some crayons or colored pencils, and the included red and blue (cyan) 3-D glasses, the children (and adults) will discover a whole new world right before their eyes. While any child can appreciate the cool 3-D effect, the art books are very beneficial for children diagnosed with Autism, ADD, ADHD and Down Syndrome. Once the child sees the depth of these images, it almost ensures they will complete the task. Wholesale is sold in packages of 15. Launch date: March 2010. — Why it won: 3-D is no longer passive! This set of coloring books allows kids to feel their pictures have really come to life. Once they wear the special, included set of glasses, their work seems to pop off the page. It's a great toy for traveling or Dr.'s offices, and will be sure to keep kids and their spectators engaged for some time. This edible fingerpaint was created in 2007 with babies in mind, adhering to baby safe ingredients which are organic. The paint is also vegan, wheat-free, sugar-free, and contains no preservatives. Babies and toddlers can start expressing themselves artistically earlier, without parents having to worry about them ingesting harmful chemicals and dyes. Fantastic Finger Paints come in 5 colors. Purple/Blue with REAL blueberries, Red/Pink with REAL beets, Orange & Yellow with REAL pumpkin and green with REAL spinach. CPSIA Compliant. Made from Organic Fruit & Vegetable powders, rice cereal and rice flour. Paints come in 6 oz. convenient tottle bottles which have powder in them. Just add the water, shake and create. Makes over 12 oz. of paint per bottle (refill bottle with water and get more paint). Must be refrigerated after water is added. — Why it won: This paint is extremely eco-friendly, and encourages parents to introduce their children to art and painting as soon as possible, without having to worry about their child being harmed by ingesting the chemicals in non-organic, non-plant based paints. This means kids can start learning forms of creative expression from a younger age. — Why it won: This cube puzzle challenges kids to use their spacial-temporal reasoning and logic skills. It's innovative design allows for more open-ended play than similar products, and it is portable for fun on-the-go.